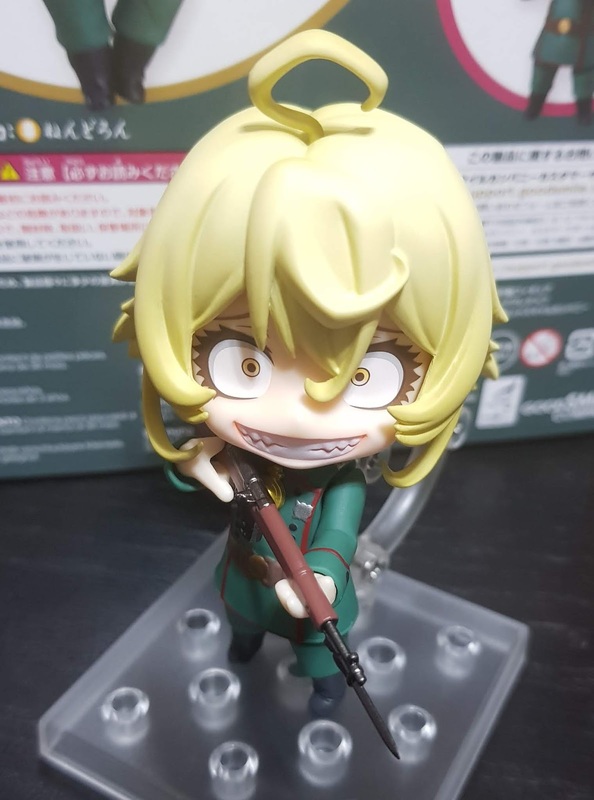 Youjo Senki is one of those memorable shows that would stay with you for a while after you watch it just because the plot is rather unique and Tanya is a very unique individual. 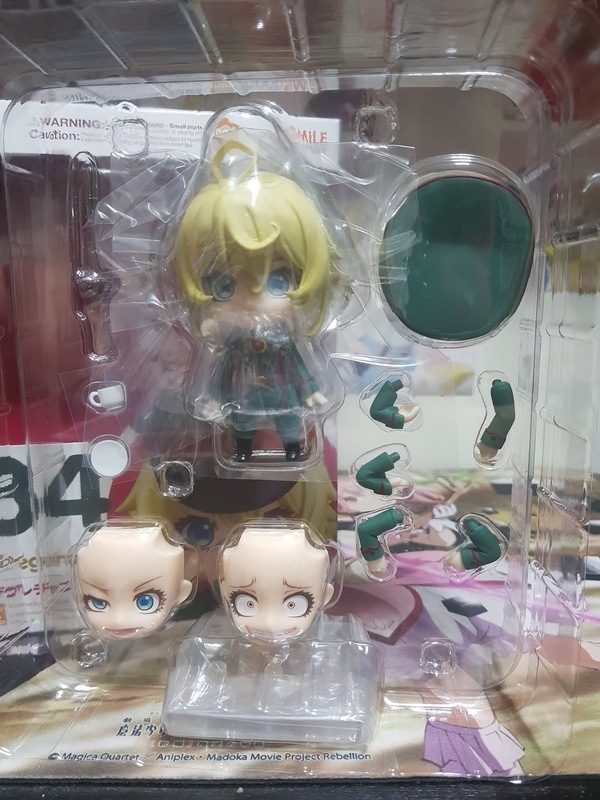 Thus, when her Nendoroid came out, I just knew that I had to get her, and that she would be a very nice addition to my shelf of insane and psychotic Nendoroid girls. I got this from Good Smile Online Shop as I felt the need to get her exclusive bonus, which can be considered a meaningful addition to Tanya if you have watched the show. However, it can also be an exclusive that can be overlooked easily if you don't feel the need to get to bonus. 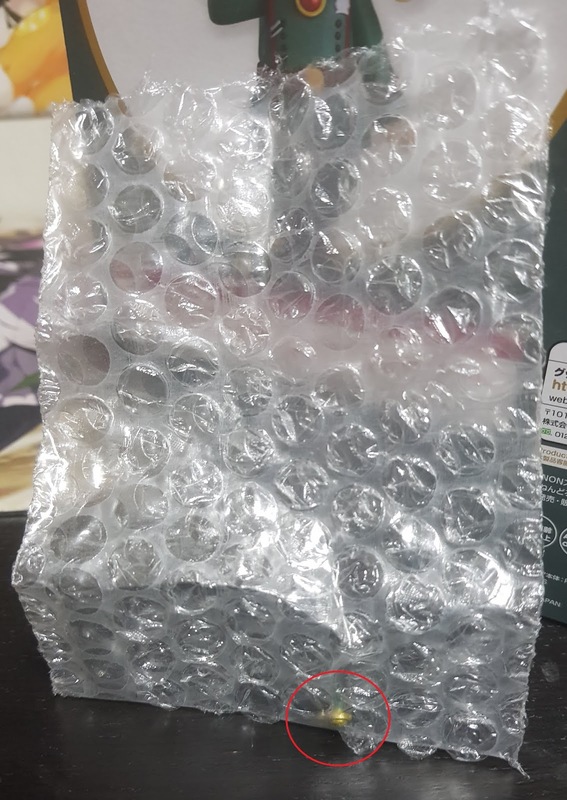 The large black plastic and the equally large bubblewrap for Tanya's exclusive is misleading as the exclusive part is really small, as indicated by the red circle in the image below. 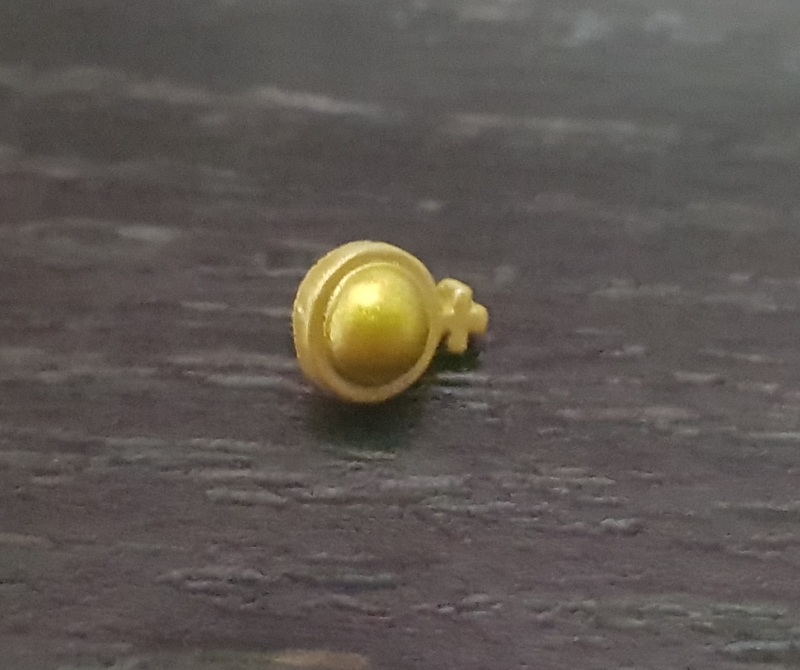 A close up of the golden exclusive! 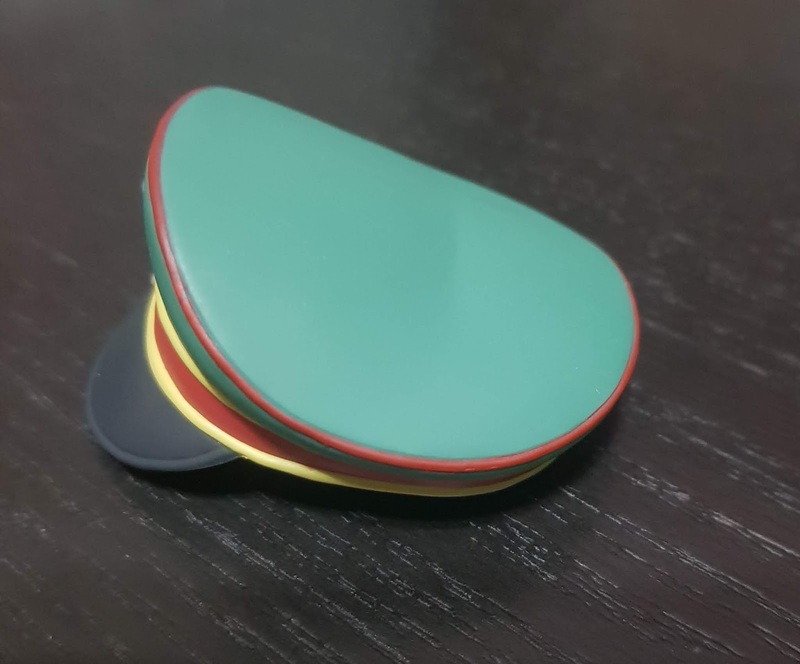 Really, it isn't a very huge exclusive as opposed to most of the other exclusives which normally features a background sheet or a rubber strap. 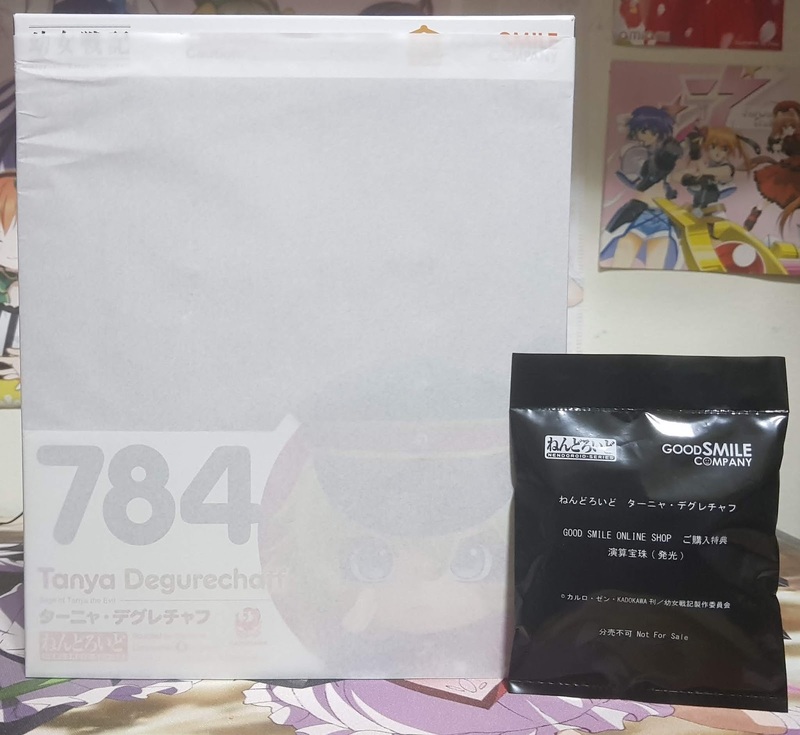 From the design of the box and the side-to-side plastic window, it seems like this was made from GSC's manufacturing company in Japan instead of the usual China factory. This plastic window gives a better look to the box as it makes it look wider and allows people to view the entirety of the product before they actually purchase it. On the flip side however, it is definitely less stable than the usual box design, but I guess you'll have to give one up or the other. The design for the back of the box looks the same across all the Nendoroids so I wouldn't touch on much about that. The blister pack clearly shows all the different components of the Nendoroid and she really doesn't come with a lot of accessories. 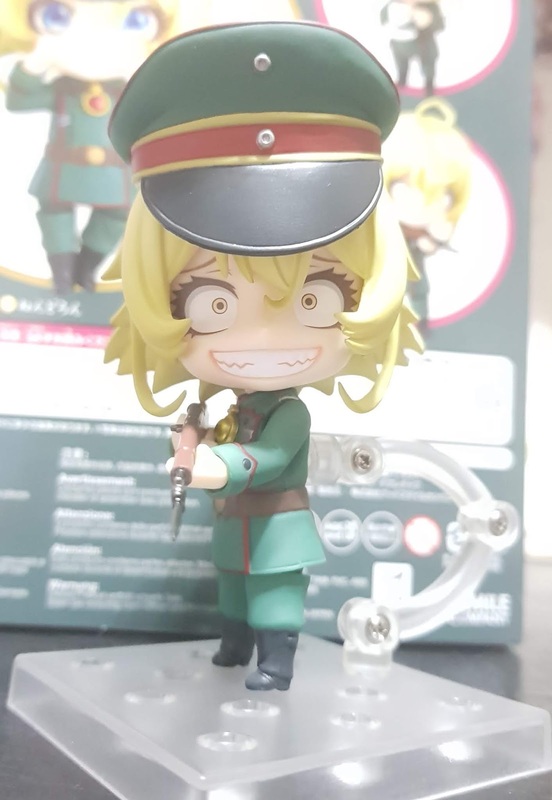 She has three faceplates, several changes of arms, a military hat, a rifle and a teacup to hold. 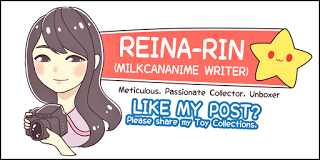 However, do note that the expression on her faceplates are rather exaggerated and gives the Nendoroid very good variation for displaying her in different scenarios. You can even make use of this and place the faceplates on other Nendoroids! As you can see, she comes with the red-gold (left) normal part, and you can exchange it with the full-gold (right) exclusive part, which God imposed on her in the series. 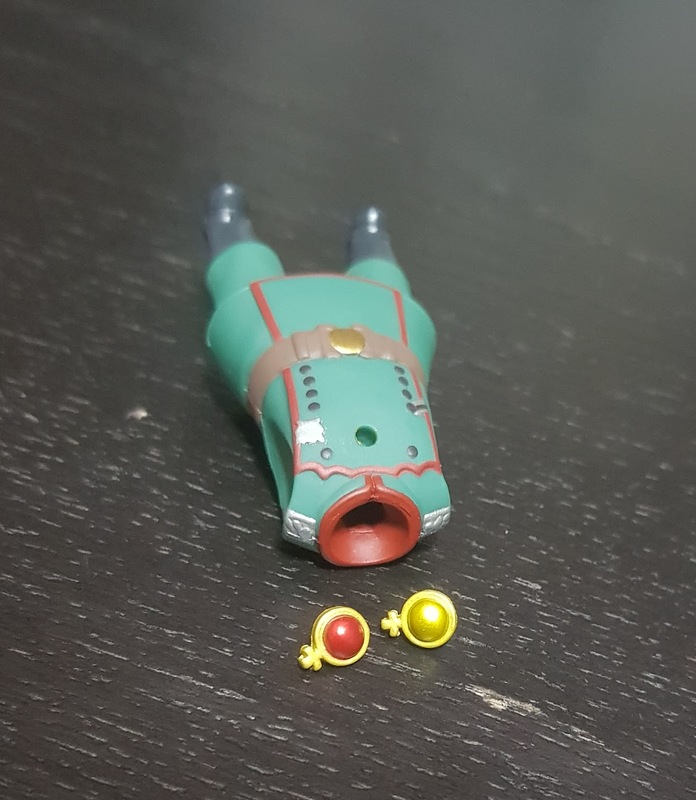 Choose the one you like and place it into the peghole on her chest! Her cap is sculpted to have a dip in the middle which helps to bring together the military look when worn. 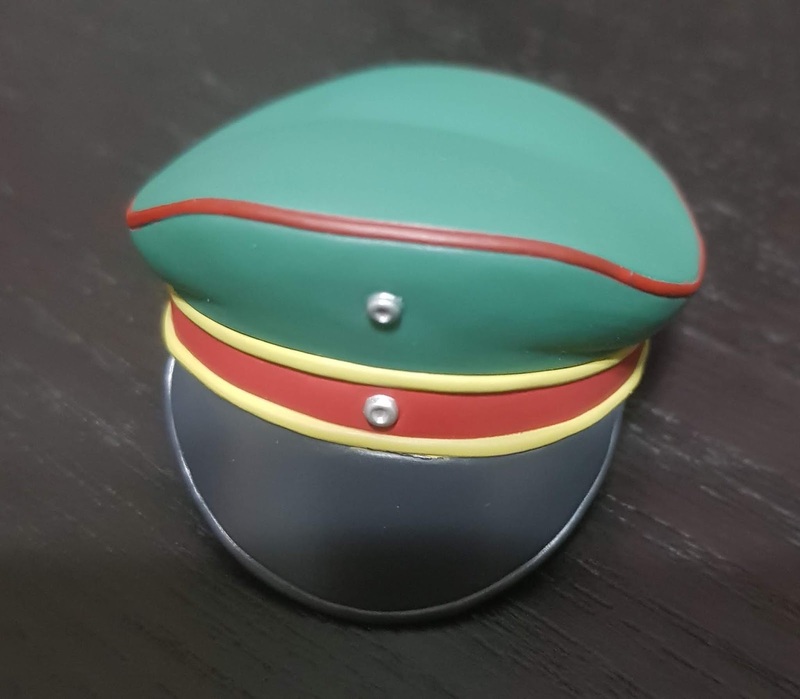 The details on the cap are accurate and cleanly painted with no paint spillovers, but if you look on the underside (image below), they actually sculpted it to fit onto the different grooves and curves of Tanya's hair. I wished that GSC would have taken an additional step and included a plastic piece of a magnet to make the cap fit better on the hair and have it fall less when transporting the Nendoroid. 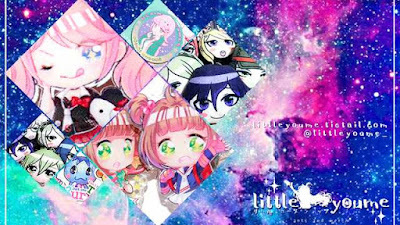 Next up, the teacup! There's not really much to say about this, other than the fact that you can easily match these with other Nendoroids, such as Chino and Cocoa from Gochuusa! 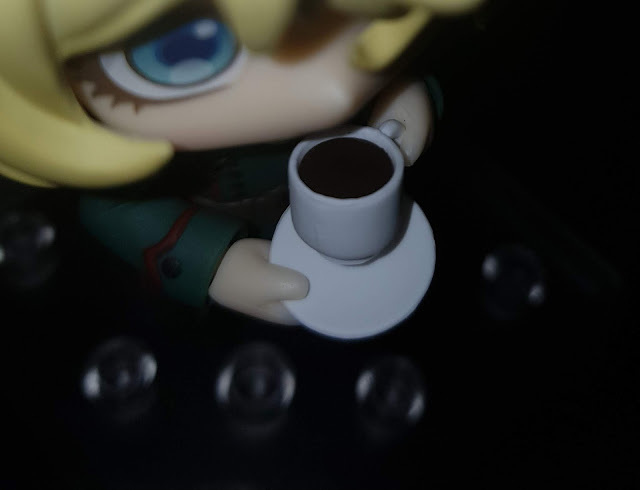 A downside of using these in display is that depending on the angle that you view the teacup by, it might appear very clunky and unnatural for Tanya to hold, especially since the liquid is sculpted with a totally flat surface and you'd have to position it as such. 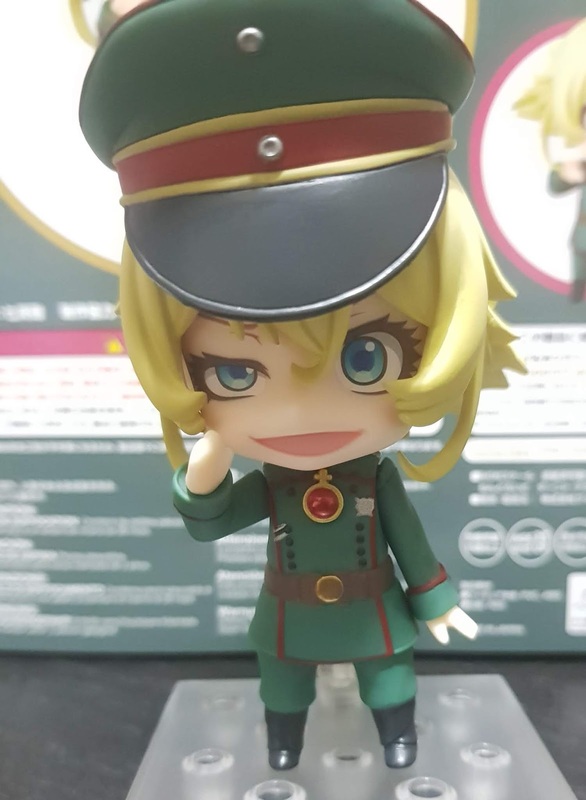 Something that is really striking about Tanya's Nendoroid is how they sculpted her hairstyle. When you look at it from the back, it barely makes any sense. From the side and front, you'll see that it really resembles the original series and they managed to keep the messy look on point. 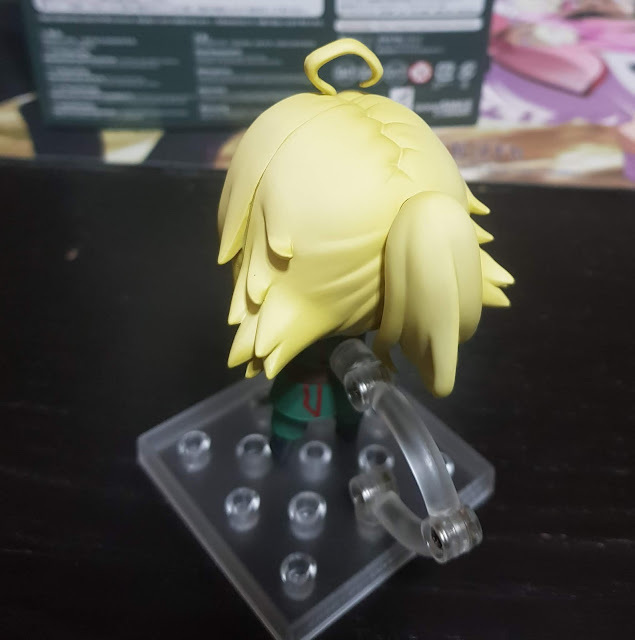 Her ahoge antenna is really cute and hilarious to look at and play with if you choose to display her without her military cap. 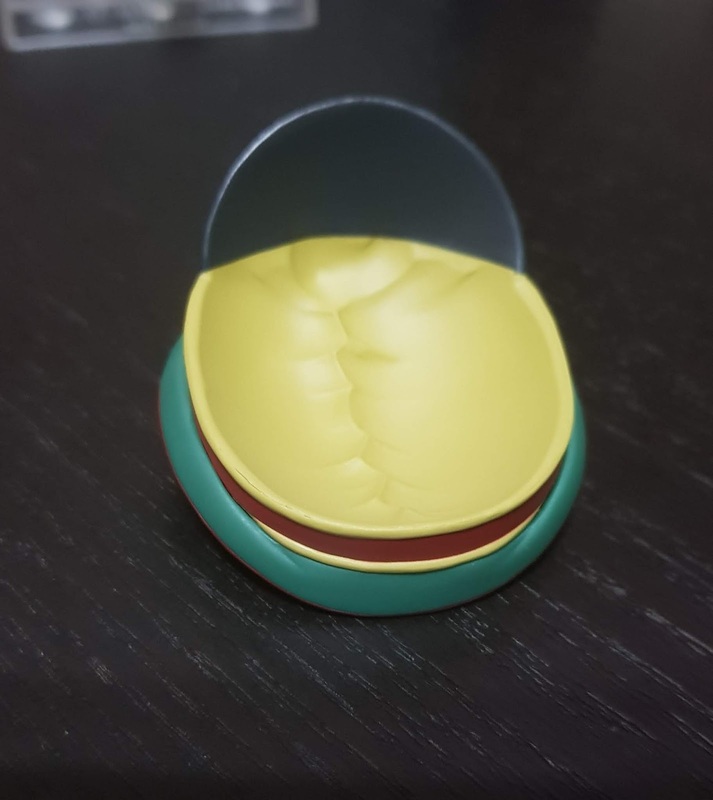 If you do want to display her with the cap though, you'll have to remove the ahoge then place the cap on. Another point to note about this Nendoroid is that with the change in lighting and angle that you view her by, her expressions can have subtle changes! A particularly bright image like the above can easily make it look like one of those battle scenes where she thrashes the opponents while flying in the sky, with the sun behind her. Personally I think that the crazed look really suits her when she isn't wearing the cap as it pulls off the battle-crazed mode better than if she was adequately dressed from head-to-toe in military garb. I actually prefer using her sneering expression if I were to want to display her with the cap. That being said, I do find that the cap looks very bulky when matched with her head and thus I still generally prefer using the previous pose, without the cap. But do note that when you are using this sneering expression, the atmosphere you can get from Tanya really varies based on the angle you view her from! 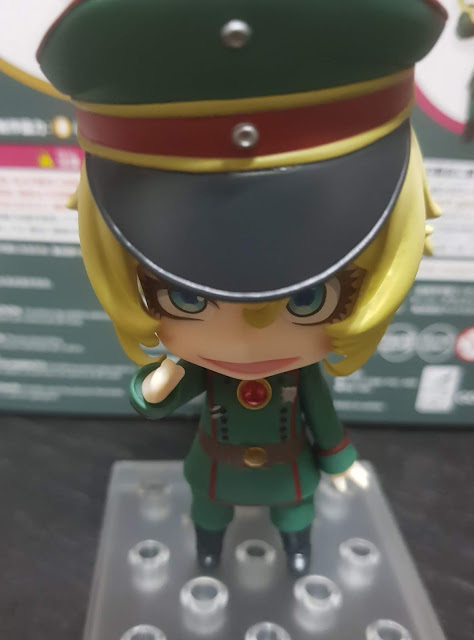 Even placing the saluting hand with her sneering faceplate can make it look as if she is looking down at you instead of saluting you! 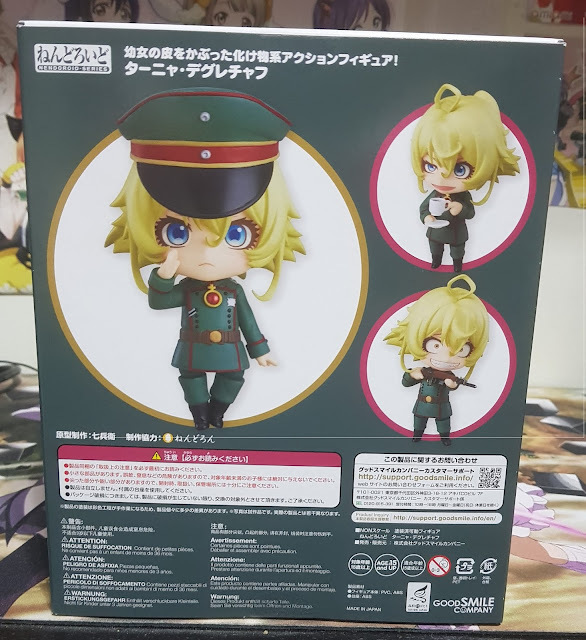 The choices of faceplates really bring out all the subtle (evil) sides of Tanya! 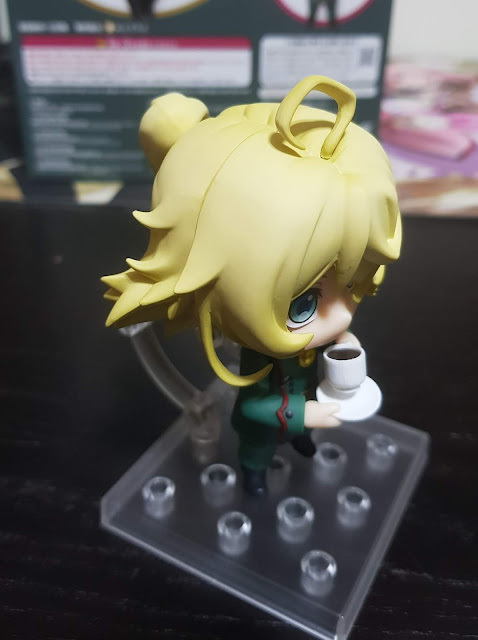 To be honest, I never did like Nendoroids doing salutes as the length and the placement of the hands never ever manage to reach quite up to where it should be, but instead ends up around their cheek area—which looks to me like they are either poking their own cheek or attempting to whisper some secrets. If you view her from a higher angle, she appears to be glaring up at you from below the rim of her cap. Match that with a dark shadow across her face and a weapon and you'll have to yourself, Tanya the Evil! 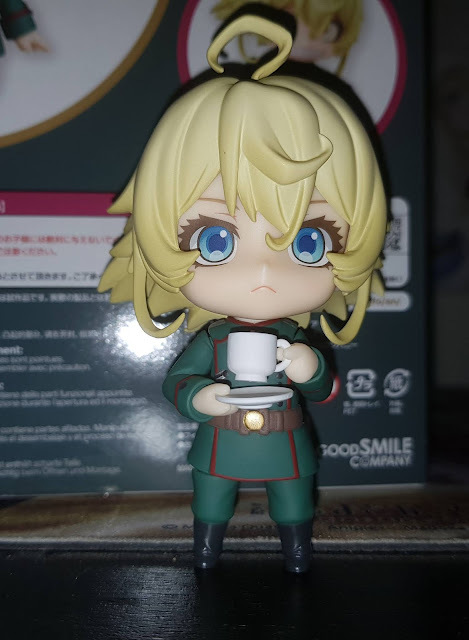 Tanya is a character deserving of a Nendoroid and I wished that GSC really took more effort into planning out her Nendoroid. They had the essentials in the Nendoroid, with her gun and cap to finish off the military look. However, they failed to showcase the other aspects of Tanya. As she can also fly with magic, it strikes me as terribly odd that they did not make any adjustments to her stand to account for that. 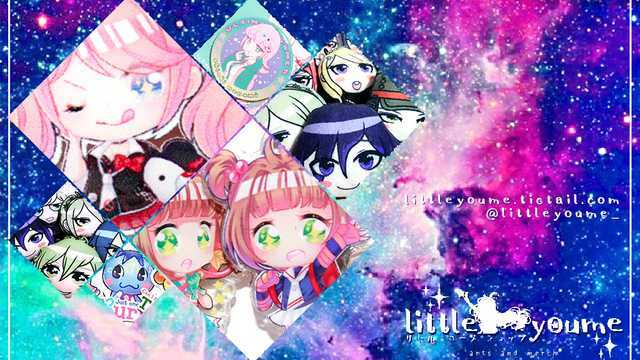 The exclusive, though a meaningful addition for me personally, was definitely not worth the increased price and they could and should have bundled it with something else such as a strap or background sheet. The part that I really love about this Nendoroid is the two other faceplates that come with Tanya as they are really different from the usual and hence are a great addition for anyone who loves to collect faceplates to mix and match with their other Nendoroids. 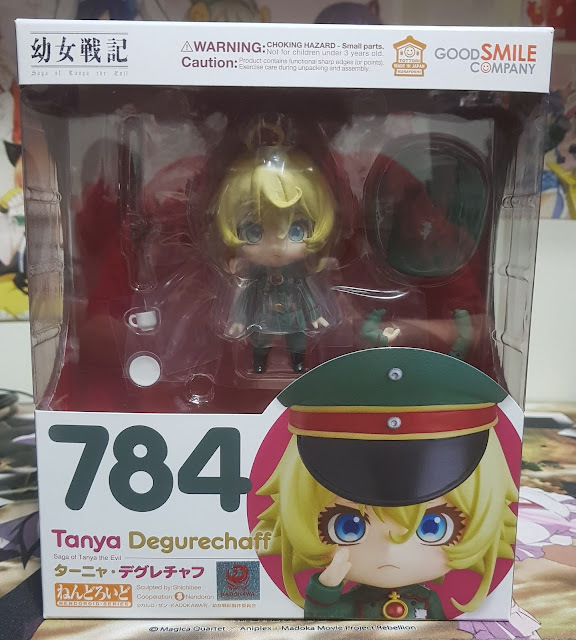 No Comment to " Figure Unboxing and Review: Nendoroid Tanya von Degurechaff (Youjo Senki) "